The Melbourne Jazz Dance Association is a non-profit organisation devoted to the preservation and promotion of vernacular jazz dance and music in Melbourne, Australia. Our goal is to produce affordable dance events for Melbourne and visiting dancers, promoting the history of the dance as well as the current dance community. That means that we like to hold really good swing dance parties and invite everyone along. Founded in 2005 by Sam Carroll, Di King, Brian Renehan, Wendy Renehan and Darren Witt, the MJDA began with its first event, Melbourne Lindy Exchange – MLX5: the Shoestring Exchange. 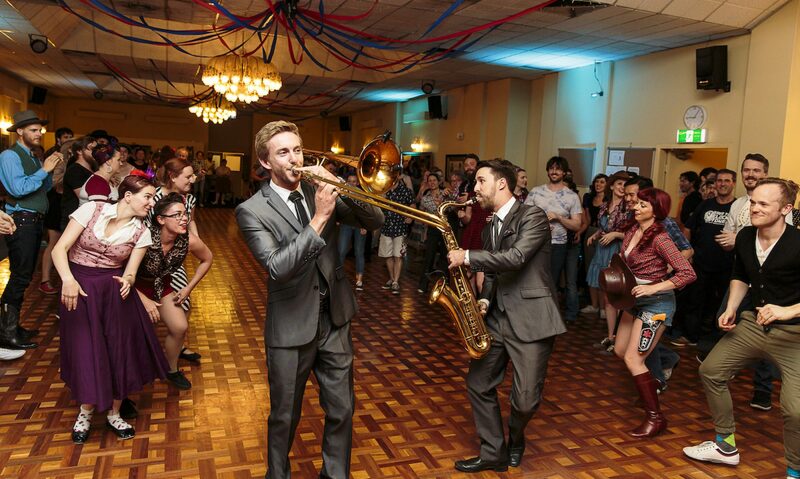 The MLX5 theme reflected not only the MJDA’s budget for the event, but also our commitment to providing affordable, quality social swing dancing events in Melbourne. MJDA has successfully run the Melbourne Lindy Exchange every year since 2005, each MLX being bigger and better than the one before. Over the years MJDA has welcomed new members and farewelled old friends. If you would like information about becoming a member of the MJDA please contact us for more information. What are ‘vernacular jazz dances’? Vernacular jazz dances developed in the United States during the first half of the 20th century and include the Lindy hop, Charleston, Balboa, blues dancing, shag and black bottom. The MJDA focuses most of its attention on running dancing events, but we're open to suggestions for alternative events, including performances, film nights, etc.